A couple of weeks ago Ben wrote about EgyptAir’s plans for their new 787-9s this year. 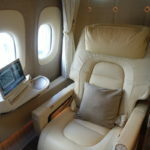 They will be receiving the first of six they have on order, and the seat map suggests they will be installing a greatly improved 1-2-1 new business class product. It appears they will offer either a reverse herringbone or a staggered layout, all with direct aisle access. Either of these would be a significant upgrade on the product they currently have. EgyptAir had filed the first 787 route to be from Cairo to Toronto, three times weekly, from October 2019. They have now updated their schedule to reveal additional 787 routes to commence prior to October 2019. This isn’t too surprising, since it’s normal for airlines to first introduce new planes on shorter routes. The 787 will then operate the flight daily from August 1, 2019. The schedules of the Dubai and Madrid flights suggests they will operate both routes from August with the same aircraft frame. Toronto will still see the 787 from October 3, 2019, as previously reported, although currently the aircraft will operate the route four times weekly, rather than three. I suspect they will have at least two 787s by the time they start flying the 787 to Toronto. EgyptAir isn’t my favourite airline, but it’s great to see they are improving their passenger experience both with new planes and what should be a greatly improved business class hard product. Traveled through Cairo last year, airport experience in brutal, beyond horrible (and I was flying J). I quite like EgyptAir. I use their economy mid-afternoon flight LHR – CAI. B777 with 9 abreast, and reasonable legroom. Then on to Dubai at about 09:00 a few days later on their A330. BA’s nighttime flight for a 4.5 hour flight would be a nightmare. What is dreadful is Cairo airport. On arrival, if you don’t have horrible immigration queues, they get you with massive baggage delays. And then there is the farce of exiting the arrival hall, for a secondary inspection. Departing CAI is, if anything, worse. Security to get into the airport (understandably), then queues for the main security screening. Check-in is never less than 30 minutes. Then a 4th queue to do the passport checks. Once through this process, you can use probably some of the worst lounges in the world. Its one of the few places where the full 2 hours before departure is needed. I don’t think so… shoddy reporting by James again! @ A – the article says the 787 will operate DXB to 30 June and then recommence on 1 August, so both routes from 1 August. Much as I love Egypt, I’ve stopped going because I no longer feel safe there. (Particularly in the region between Asyut and Luxor.) It’s very unfortunate. Hopefully the day will come when I’ll once again feel comfortable returning to one of the most fascinating countries on the planet. Cairo airport with all its shortcomings has Gold Track for *A Gold passengers (albeit the immigration one doesn’t work at all times) as well as a dedicated island of checkin desk for EgyptAir business/*A Gold and so technically speaking the queues people are complaining about shouldn’t be a thing if you have status. It takes me 10-15 minutes to go through initial security, check-in and passport control to the lounge. EgyptAir has also streamlined the process for connecting passengers and as far as I know horror stories of the past are gone. T3 is also undergoing maintenance (especially for baggage claim area) so that whole process could be sped up. Improvements are slow, but are definitely there. Things haven’t changed since 1993 when I first went there. It’s the filth and dirt in the airport at Cairo. It’s the worst part flying EgyptAir with service and food not far above it. UGH! Now lets talk about the return flights… First leg…Food was horrific (at least the tea was good)… Same lounge experience…. Second leg… my seat was broken.. legs only went up about six inches. So imagine upper body laid back and feet only raised about six inches. Five hours into the flight I thought about putting my backpack under my feet and bam almost a layflat. Oh did I mention my TV didnt work either. Food on this leg was also horrible. Cant complain about the attendants on either flight as they were all smiles. Not on my list to fly again. I actually don’t know why people hate Cairo Airport so much. I’ve had only perfectly okay and, actually, quite pleasant experiences there (Alitalia to/from Rome). The only problem is, aside from bathrooms, the airport seems to be really dirty. But nothing there seemed as dirty as Geneva airport, so not too bad, you know, considering. Was there last month on an ancient 777 from JFK-CAI, had a three hour layover in a horrible airport after a 10 hour flight with terrible service and satisfactory meal(s). Throwback to 1990. I was flying with my wife and 18 month old daughter from Cairo to Luxor. I thought I was up to date with ‘knowing my aircraft.’ Whilst it looked vaguely familiar with 4 engines – I just couldn’t pick it until taking my seat and reaching for the emergency card. It was a Boeing 707 (for goodness sake!!) – I had previously only seen these in photos. Well it rattled and roared on take off (and I mean rattled) – but we got there. I reckon a 787 is quite the improvement.